First off, let me say that we loved and appreciate all the wedding bounty we received. We are very grateful for all the amazing kitchen equipment, gadgets, Hotel Collection towels, wine glasses, cutlery, place settings, gift cards, money, etc. etc. With that said, I am going to call out one particular gift that we just happen to LOVE LOVE LOVE! This thing is awesome. The one we have holds two gallons of water and sits nicely on our countertop. At the press of a button – you can have cold water, room temp water, or hot water. And it’s hot hot water – perfect for tea anytime. We got so used to having a nice hot/cold water filtration system while we were living in Korea. So we looked into the best options for having one at home. We weren’t looking to go office-style cooler – you know, the big stand up versions. And we wanted something better than our Brita water filter (I HATE having to fill that up so much – and we drink a lot of water. Plus it doesn’t do hot water). 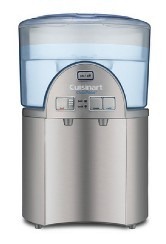 Although this Cuisinart one is not as awesome as our Korea system (that one never needed filling up since it hooked into our kitchen faucet), it’s a great alternative. I still don’t like filling it up (Micah takes care of that), but it doesn’t need filled up as often. The other two small downsides: it’s a bit slow to fill up your glass and it needs plugged in – so it’s a little loud when it’s doing its “thing.” (But it doesn’t make noise all the time). Nonetheless, I highly recommend!!! It’s a bit pricey, so it was a perfect gift for us (thanks Rory and Jessica), as we probably wouldn’t have bought it on our own. can we use it as a wedding gift? Hmmm… If only we still had room on our countertop…what with the coffee maker, Kitchenaid mixer, toaster oven (oh wedding gifts, you take over my life but I love you) we barely have room to cook!! I understand!!! We haven’t even unpacked our Kitchen Aid or toaster oven for lack of space!